Developing your team’s philosophy (read more about 4 Steps to Building an Effective Club Culture) is an important step, probably the first step before even hitting the fields. Knowing what you stand for is an important aspect of a team’s identity, especially when facing adversity. You and the ones within the team need to know what you stand for, how you operate and what your short/long term goals are. At a young age it’s easy to disguise success through winning. On paper everything looks great – the kids are passing well, scoring goals, smiling faces and parents are having a pretty good time on the sideline. Why do those teams and players disappear down the stretch? 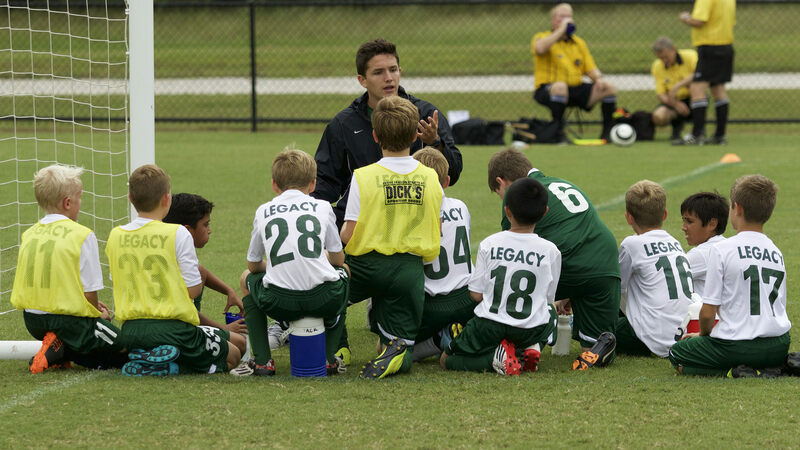 In youth soccer, the term “player development” is probably the most used word. As much as it’s used, it is also misused. Understanding that when winning becomes the focal point at early stages some very important lessons are missed and wrong values are thought which can be detrimental for their future careers. Develop and follow a curriculum that stresses on individual player development that progresses to a team concept. Don’t cut corners during tough times! Make your players comfortable with the ball and educate yourself how to teach the right technique. Young players should be able to engage multiple players without the fear, the process that will help build their confidence. Let your players know that it is ok to make mistakes as long as the right decision was in mind. Provide your players with plenty of playing time and give them time to develop. Reward hard work, creativity, positive attitude. Place players in different positions, even in the ones they’re not good at. Keep yourself from using tactics that will not benefit players on a long run. Coaches can be easily tempted to skip this important step for a few wins and medals. It might sounds like a cliché but the truth is everyone makes mistakes. So, why would you hold younger players more accountable when even at the professional level there are plenty of mistakes. Don’t get me wrong, you shouldn’t support mistakes due to lack of effort or hard work — but should approve of the ones that are made out of trial. Be supportive of your players and teach them that mistakes are part of the process and not the problem. The problem is not correcting them. Let your players make decisions and let them figure the game out for themselves. Soccer is a game of lots of combinations and it is impossible to predict them all. Rather than telling them what to do, equip your players with a set of tools that will help them solve the game situations. When your players enjoy what they do, they will have plenty of motivation to keep learning. Make the learning experience be more important than the outcome. The more they learn, the more capable they will be later in their career when winning becomes more important. Understanding the game and why things are done certain ways will be as important for your staff as for parents. Educate them and have materials available that explain your philosophy. They will need to be patient with the process as results are not visible immediately. It will be very tempting to compromise the developmental path and maybe play a stronger, faster player in only one position or not play those that are as skillful. You, and more importantly, your players will pay the price at the later stages of their career by cutting corners. They won’t be either comfortable in more than one position or will not have enough confidence in their abilities, all of which could’ve been managed during their most critical ages. Understand that your teams might be losing, a lot, but all your work will pay dividends at the later stages. In conclusion, it is not a secret that Paul Scholes was one of the smallest players in the Manchester Untied academy. On top of that he was also asthmatic. He could’ve been easily left behind. It was a challenging task for coaches to turn him into a world class player. But with the right nurture, patience, and a lot of hard work on player’s behalf he turned out to be one of the most complete midfielders Manchester United have had in their rich history. Excellent and succinct post! It seems that every coach and soccer club around is talking about player development, the problem is its misuse and many don’t seem to know what exactly player development means. Thanks for the post. Glad you liked the post. There will be more articles coming up regarding player development and related topics. It is very good,thank you! Great stuff. Very insightful and informative.